Karthik is a herpetologist and field biologist at the Wildlife Insitute of India (WII), visit this Dehradun. He has worked on projects that involved studies on crocodiles, mind freshwater turtles, link agamid lizards and frogs in different parts of India since 1992. 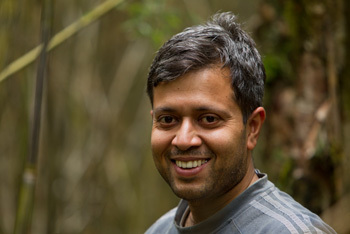 His research interests are identifying drivers of endemism; factors that influence endemism in higher taxonomic orders; ecology of endangered herpetological species; developing field techniques for the study of rare and endangered species; and developing monitoring protocols for endangered species. He currently has research projects in the Western Ghats and the Andaman and Nicobar Islands studying herpeto-faunal diversity. He is involved in teaching herpetology, behavioural ecology, community ecology and conservation biology for post-graduate students. He is also presently the Co-chair of the Amphibian Specialist Group, the South Asia region.